Positive proof that our Modeling Page inspires more models! Several years ago, TMS member Rob Ulaner, who is President of the California Capital's Disneyana Fan Club, contacted The Monorail Society to inquire about the possibility of purchasing Kim Pedersen's Mark V model. Pedersen was very flattered, but definitely not interested in giving it up. Determined to own a quality Disney monorail model, and thanks to a generous 50th birthday present from his close friend Phil Montejano, he enlisted the help of aviation aircraft modelers in the Philippines. The Philippines have become known as a great source for high-quality wood models, yet aircraft are usually what they build. However, Ulaner found a modeler willing to take on the challenge. The image above shows the project well under way. 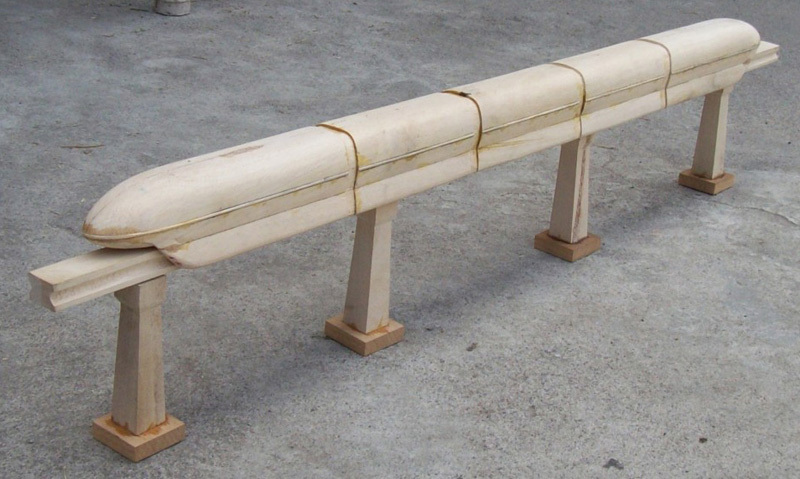 Ulaner supplied the modelers with 100s of Mark VII photographs to help them create this three foot long model. Rob tells us, "I am certain we must have exchanged at least 50 e-mails back and forth both to clarify details and my quality checking the model every step of the way." Ulaner's gorgeous Mark VII model after eight months of work in 2010. Ulaner says, "So the big question, is why would I have this particular train modeled? Well to put it simply, I am a Disneyland Monorail fanatic! I was so taken with the new design, I had to have a model of the Mark VII." Note the detail of the paint scheme, gorgeous! Anyone who has modeled can appreciate the fine work here. Thank you Rob for sharing it with us!